In a meeting chaired by the district incharge minister Umesh Katti on Tuesday, he has directed that the Indoor stadium along with Laser tek park be built at the spot first identified near Dharmanath Circle. It was earlier reported that the same plan was shifted to Vaccine depot, but the minister made it clear that Vaccine depot was not a spot for such activity and land near Dharmanath circle of 8 acres is the most ideal. EOI’s were called for in August 2010 and the was estimated to be Rs.16.5 crores. The stadium will have indoor games, including basketball, volleyball, shuttle badminton and table tennis courts with some other facilities including a laser tek park. 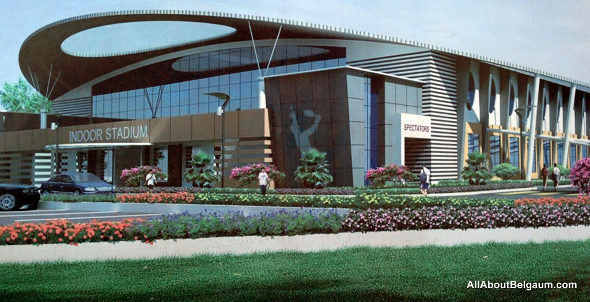 The stadium will be built on 2 lakh 60 thousand sq foot with an indoor stadium of 35 thousand sq.feet area. A swimming pool has also been planned in the same premises. There is a huge “under construction” commercial building which belongs to the minister and is at a walkaway distance from the Dharmanath Circle. Why wouldn’t he want it back. no but this is on a 8 Acres which is now divided into three parts. currently part 1 and part 3 are with the Corporation, but it seems they have allotted Part 2 to some one else. Hmm, I guess, I wasn’t clear enough, I was stating a stadium if build close to his private commercial building (currently under construction near the srinagar garden bridge) will only increase the revenue from the building.